“Videodrome” was on TV the other day and I was dying to watch it again – I saw it when I was a teenage girl – but I was so sleepy I could barely watch the first 5 minutes. One thing I did not recall about the movie was Debbie Harry as part of the cast, and that made me curious. Preheat the oven to 180°C/350°F. Lightly butter a 20cm (8in) square pan, line with aluminum foil, letting it hang about 5cm (2in) over the sides. Butter the foil generously. Place butter in the bowl of an electric stand mixer. Use the flat beater to beat the butter until fluffy, about 2 minutes. Add the sugar and cream well, another 2 minutes. With a fork, beat the eggs in a small bowl and mix in the vanilla extract. Add to the butter mixture and blend well. Sift the flour with the baking powder and salt. In three stages, add to the butter mixture, blending well after each addition. Use a rubber spatula to scrape down the sides of the bowl. Add the nuts and white chocolate and stir with a rubber spatula to distribute evenly. Scrape the batter into the prepared pan and use the rubber spatula to spread it evenly into the corners. Bake the blondies for 28-30 minutes or until a cake tester or toothpick inserted into the center comes out with no crumbs clinging to it. Remove the pan from the oven and cool completely on a rack. Lift the blondies from the pan with the aluminum foil. Carefully peel the foil away. Cut into squares. I've never had a blondie before. Might need to try this recipe! 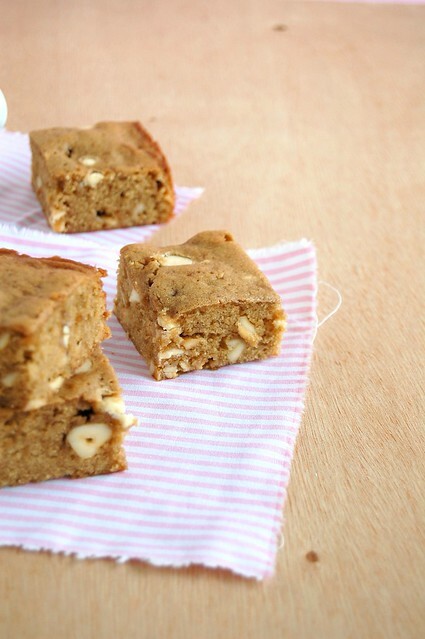 Yum, I love baking with cashews! I don't make enough things with them. 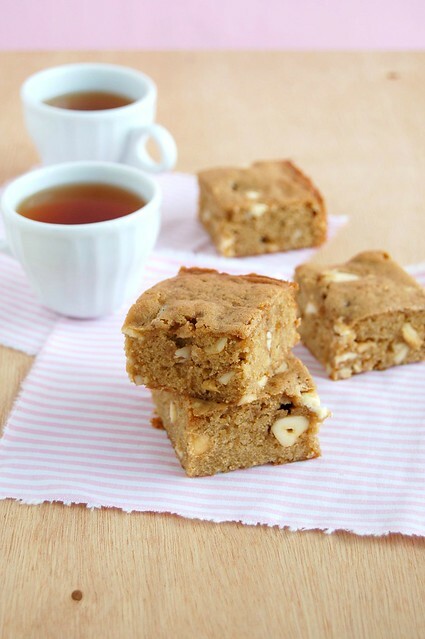 Those blondies looks super irresistible.. I never think to make blondies (it's always brownies!) but these look fantastic. Pretty and delicious! These look awesome! Long live the new flesh! Sadly mine came out a bit rubbery. Are you sure about the butter? Maybe a little more? Dear Sarah, I'm so sorry! The butter amount was incorrect. I've corrected it now. My apologies!